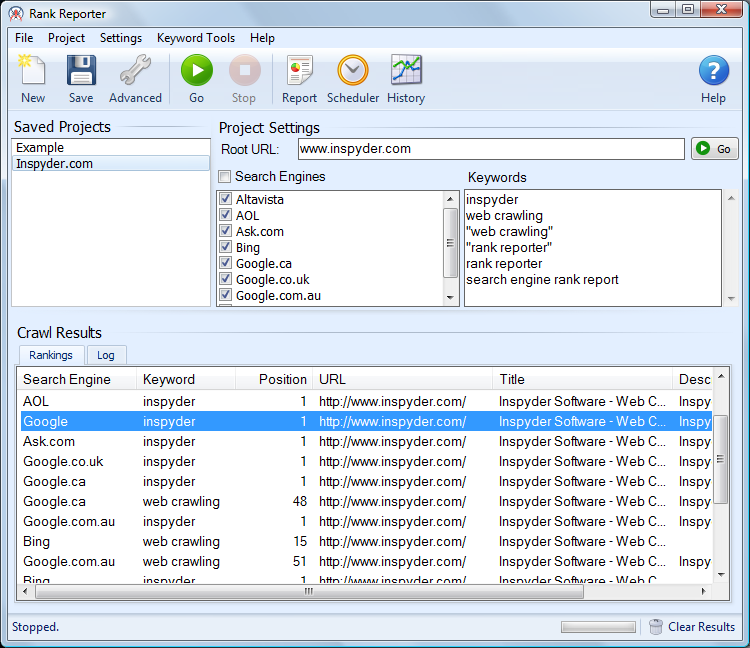 Track your website's Google ranking the easy way with Inspyder Rank Reporter! Just enter your URL, some keywords and click 'Go'. What could be easier? Rank Reporter automatically runs your search queries to gather accurate search ranking information for your website. You'll know your exact Google ranking each and every day. Rank Reporter checks your Yahoo and Bing rankings too! Rank Reporter can automatically email you a daily, weekly or monthly report with your website's ranking performance. Best of all, Inspyder Rank Reporter has no keyword limits! Keep track of as many website ranks and keywords as you need. Rank Reporter can also track your competitor search rankings. Just add your competitor URLs to your project and let Rank Reporter do the rest. You'll be able to watch the results of your SEO effort and compare it to your competitor progress. Download a free trial and start monitoring your website rank with this easy to use Google ranking checker.